NEW BRITAIN - Ryan Fulse came into Saturday’s game as the FCS’ leading rusher, but Aaron Dawson did everything he could to steal the show. On a day when the wind and the rain pelted Arute Field, Dawson set one school record and tied another. Central Connecticut State’s sophomore tailback ran for a single-game school- and NEC-best 361 yards and five touchdowns, including four in the second half of 40 yards or more, as the Blue Devils beat Wagner 49-24 for an important bounce-back win. Most of Dawson’s yardage came after halftime. Over the final two quarters, he ran for 308 yards, which included a touchdown run of 45 in the third to give CCSU the lead for good at 28-24 as well as ones of 57, 60 and 55 in the fourth. The runs of 57 and 60 came on back-to-back plays for the offense. Fulse, meanwhile, didn’t find the end zone, despite running for 179 yards on a career-high 43 carries. But before Dawson and the offensive line took over the game at the 11:32 mark of the third quarter, CCSU (5-4, 3-1) found itself in a back-and-forth battle. The Seahawks (2-6, 1-2) jumped out to an early 14-0 lead after Charbel Dabire returned a blocked punt for a touchdown and Titus Leo came up with a pick six on a Jacob Dolegala pass on the Blue Devils’ next possession. Dolegala threw just 15 passes for CCSU and completed six of them for 74 yards and a touchdown. The Blue Devils, however, scored 21 of the next 24 points. Safety DJ Exilhomme recovered a fumble in the end zone with 5:43 remaining on the first-quarter clock. Dolegala then connected with Jose Garcia for a 39-yard score a little less than three minutes later, while Dawson’s first touchdown - a 23-yard run - in the second quarter put the Blue Devils up 21-17. The Seahawks only points during that stretch came on a 36-yard kick form Eric Silvester. All three of the Blue Devils’ touchdowns came off Wagner turnovers. 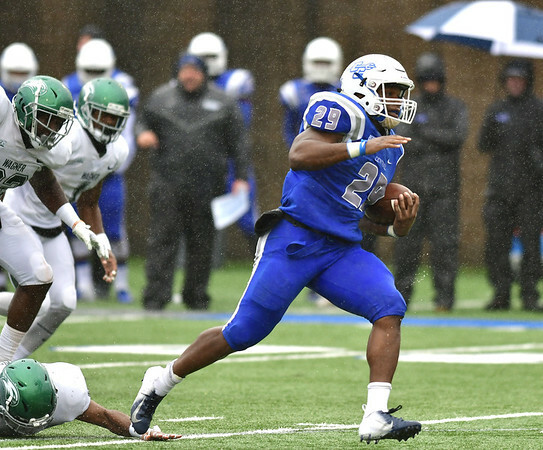 While the weather played a factor, CCSU’s defense specialized in taking the ball away on Saturday. The unit finished with eight forced fumbles, five in the first half, recovered four and had two sacks. Kevin Loschiavo also intercepted a Luke Messei pass for the Blue Devils. Perhaps CCSU’s most important fumble, outside of Exilhomme’s touchdown, was forcing Fulse to give up the ball on the Blue Devils’ 1-yard line right before halftime to preserve the 21-17 lead. The win should be an important momentum builder for CCSU, which remains in the running for the NEC title. The Blue Devils have two more conference opponents left on the schedule in St. Francis (Pa) and Duquesne following their upcoming bye week. Posted in Newington Town Crier, CCSU on Saturday, 27 October 2018 17:18. Updated: Saturday, 27 October 2018 17:20.